Abacus Automation was approached by Tongaat Huletts to provide a cost-effective network solution for its industrial equipment at a plant in KZN. At the time, all industrial communications took place over the refinery’s IT network but, while the network itself was structurally sound, there were administration and other issues. Primarily these revolved around IP allocation and reservation as well as the fact that all IT traffic, including e-mail, was now mixed with the industrial communication. As most system integrators will know, this is a less than desirable situation. So, a plan had to be made to separate the networks, giving the control and automation personnel authority to assign and reserve their own IP addresses securely. The new network would need to link existing scada and PLC systems, mainly transferring process data as well as linking areas of the refinery that were previously without connectivity. The Panhouse refines raw sugar before passing it onto the Rotex room where the sugar is sifted and then moved via screw conveyors to bins in the Packing Hall where the refined sugar is packed into its various final forms. One requirement of the new network would be to link the Panhouse to the Packing Hall and Rotex room, giving the Panhouse operators a better view (via new scada screens) of the status of the downstream machines, allowing them to react faster to problems occurring down the line. Previously, a problem in the Rotex room could go unnoticed and result in an unexpected crash-stop of the Panhouse. Now, the operators are able to be pro-active and initiate corrective measures as required. After surveying the site, it was clear that wired solutions would need cable runs greater than 100 metres implying the use of repeaters to ensure proper transmission. Since the three main facilities on the plant all had line-of-sight to the central Rotex room, an alternative wireless solution was proposed using Ubiquiti NanoStation M5 radios. These radios, proven in other industries, have an established support network, excellent wireless range, PoE enabled ports and rolling-cipher encryption on the network. The radios use regular 802.11n WiFi connectivity and are set up as WDS (wireless distribution system) transparent bridges, which means that all traffic is forwarded at Layer 2 of the network model and the radios are theoretically invisible to the scada PCs and PLCs with no routing or gateways necessary. The fact that the Ubiquiti radios also utilise the 5 GHz band is a plus as it is less congested than the regular 2,4 GHz WiFi band. The wireless-N standard was sufficient as this provided 150 Mbps, while the majority of most industrial automation equipment has a maximum link speed of 100 Mbps. 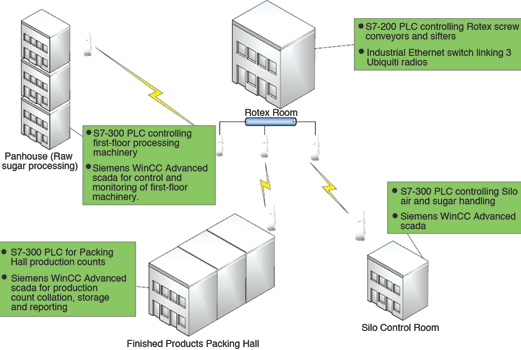 The network, linking the Panhouse, Packing Hall, Silo Control Room and Rotex room, is set up in a multiple point-to-point topology with the capability of failing over to a point-to-multipoint architecture. With three redundant radios at the central Rotex room linked via an industrial Ethernet switch to ensure a higher network uptime, the total number of radios in use is six. These radios are all powered via PoE injectors, reducing cable runs as well as the number of entry points into the weather-proof boxes used to house them. 1. Packing Hall: S7-300 that has the main function of production count for finished and speciality products. 2. Rotex room: S7-200 that controls all screw conveyors and sifter machines. 3. Panhouse: S7-300 that controls all first floor machinery in the building. 4. Silo Control Room: S7-300 that controls air handling and sugar transfer functions in the silo areas. * Packing Hall: running WinCC Advanced that collates production count information and stores the data for retrieval and reporting. * Panhouse: running WinCC Advanced and VNC server for monitoring of first floor machine information. * Panhouse: VNC client for mirroring first floor scada information to fifth floor operators. * Silo Control Room: running WinCC Advanced. * Planned Master Control Room: running WinCC Professional for monitoring plant-wide operations. The net benefit is a fully scalable plant-wide wireless infrastructure that delivers data efficiently over a network that is completely separate to the office IT infrastructure. This has given the production personnel a more efficient and secure network set-up that maximises overall plant uptime, efficiency and profitability.